For this aspiring superstar of country music, the only time he may ever hear the word "impossible" is when they say the title of the first number one hit from his Man With A Memory CD. Despite the fact that he looks more like a GQ model than a country music singer, his voice immediately over-rides his attire. 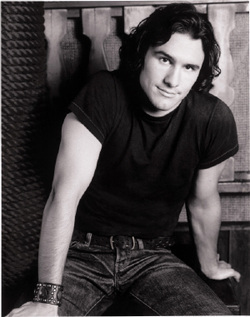 The first time you heard Joe Nichols on the radio, you knew you were listening to the heir-apparent to an elite list of country music legends. That observation was confirmed during NFR (National Finals Rodeo) week in Las Vegas, Nevada. As the cowboys kept folks entertained at the rodeo arena, Nichols, in between his two concerts at the Boulder Station Casino, was busily making personal appearances all over town and easily charming the socks (or cowboy boots) off of tourists and locals alike. It isn't just his voice that endears him to music fans. Nichols is a throwback to the "good ole boy," country music icons of yesterday with his laid-back demeanor and quick, easy smile. The size of the venue doesn't matter because he makes you feel like you are sitting in the front row seat of your favorite, local honky-tonk. In a two concert series, jointly promoted by KWNR radio and Station Casinos, fans only had to donate a toy to the local Wednesday's Child Charity to garner a ticket to Nichols' concert. This proved to be the biggest bargain in town during NFR week. For your act of kindness you were rewarded with nearly two hours of non-stop, first-class entertainment. In between songs Nichols exchanged easy banter from the front of the stage with various members of the audience as he gave a brief intro into each song. His play list is comprised of songs from Man With A Memory and a versatile mix of his own traditional country favorites. Nichols opened his show at the Boulder City Station Casino with a heart-tugging rendition of the Hank Cochran penned "A-11," but the tempo quickly changed to up-beat when he barely took a breath before leading into the quick paced "Joe's Place" from his current CD. These first two songs set the pace for the next ninety minutes, and although the audience barely had a chance to breathe between songs, they were happily caught up in the momentum. After several standing ovations, the first one for "Cool To Be A Fool" (which he co-wrote), the audience just stayed on their feet. Sitting was no longer an option. He introduced this delightful, toe-tappin' song by saying it was "autobiographical" and he clearly had a great time poking fun at himself with the lyrics and enjoying the audiences reaction to his words. Before anyone had a chance to recover from the intense workout he had just given their funny bones, he changed the emotional pace once again to sing one of the most beautiful love songs I have ever heard - and the song that he proclaimed to be his personal favorite from the Man With a Memory CD - "That Would be Her." Giving the audience, and perhaps himself, a much-needed break, he slowed the tempo and transitioned into "The Impossible." But if a lesser pace was the plan, it distinctly backfired. As the first strains of the melody came over the footlights, the audience was once again in the throes of a rowdy standing ovation that made it nearly infeasible to hear him as he thanked everyone in radio - and all of those who had purchased the album - for helping make this song his first number one single. As the band took a break, Nichols and his long-time friend and lead guitar player, Brian Spradlin, stayed onstage to treat everyone to a delightful acoustic set of songs that included the Charlie Pride ballad, "The Rose." When the band returned, Nichols introduced each of them to the audience. He preceded the actual introduction by saying, "I would like to introduce you all to two of my favorite people" and as he pointed to the band he said, "Band meet the audience" and then he pointed to the audience and said, "Audience meet the band." You knew he was serious. It is clearly evident that he loves what he is doing and it is quite likely that "the band" and "the audience" really are his two "favorites." Judging by the thundering applause his remarks generated from the audience, they definitely believed him. He closed his concert by singing, one more time, the song he credited with bringing him to where he is today, "The Impossible." As he exited the stage, the audience obviously wasn't ready to let him go. The sound of "encore" quickly permeated the Railhead along with sustained applause. It was clearly evident that no one wanted the show to end but despite persistent pleas of "one more time" from everyone in attendance, it appeared the concert was over until a tall, incredibly handsome cowboy in a white hat appeared from the back of the darkened stage. The audience became nearly hysterical as they realized it was Joe Nichols... now looking every inch the way he sounds. The thunderous applause resonated off the walls and ceiling and, for the first time, I understood what folks meant when they said, "he nearly brought the house down." As Nichols exited the stage one final time, the announcer promised that Nichols would be out front shortly to shake hands and meet with anyone who wanted to say "hi." As we made our way out of the casino, we had to circumvent a continuous line of people that stretched throughout the building - all taxiing for position in the endless merchandise line. ​I said it before and I'll say it again: J-o-e N-i-c-h-o-l-s. Write that down. You don't want to forget this name. You are going to be hearing it a lot ... especially at the various awards shows for the next several decades.